Looks like unlocking cellphones is starting to become a trend. 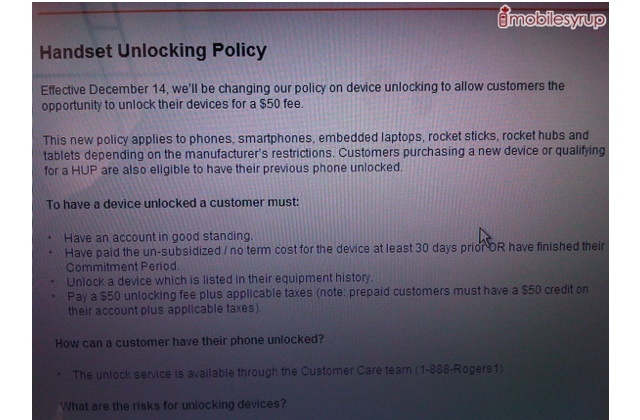 Recently TELUS announced they will unlock various devices for a fee starting in 2011… but today both Rogers and Fido have stepped up with a new “Handset Unlocking Policy”. Of course there are some stipulations to having your device unlocked. If you’re on a contract you’re not going be the happiest person: Your account must be in good standing and you “Have paid the un-subsidized / no term cost for the device at least 30 days prior OR have finished their Commitment Period”. Of course there are several other 3rd party options to unlock your device… Progress right?